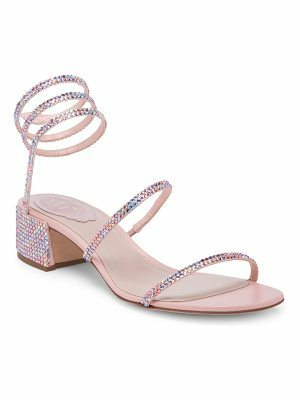 Sophia Webster leather sandal with faux-fur (acrylic) trim. 5" covered heel. 0.8" platform; 4.2" equiv. Three-strap upper. Adjustable ankle strap. Smooth outsole. "Bella" is made in Brazil.